In the Amazon city of Iquitos, Peru, a pilot study is being carried out to improve the lives of some of the poorest families and to take small steps to address climate change and reduce deforestation of the Amazon. For centuries, farmers along the Amazon have made a living growing cassava, maize, rice, vegetables, and raising poultry. The burgeoning mining and petroleum industries, along with increased flooding have changed the face of their province, and caused a large-scale migration from the rural, forested areas to urban centers. Families have set up small settlements with makeshift houses on the outskirts of many of these urban areas, but many live in poverty. These peri-urban dwellers also often pay a very high price for fuel wood for heating and cooking. A project led by Dr Lukas Van Zwieten from the New South Wales (Australia) Department of Primary Industries (NSW DPI) with funding from the Public Sector Linkage Program of the Australian Government is working closely with the Peruvian Ministry of the Environment (MINAM), Ms Nani Alegria of Instituto Tangarana (IT), and Dr Brenton Ladd of the Universidad Cientifica del Sur. 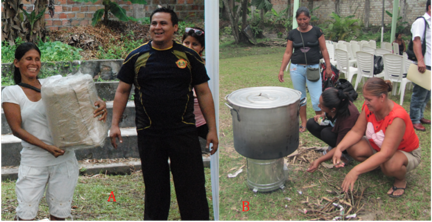 In September 2013, the project organized a workshop at Instituto de Investigaciones de la Amazonia Peruana (IIAP) on the operation of cookstoves. Over 50 women attended from regional areas around Iquitos, some traveling over three hours to attend the workshop. One workshop participant, Hilde, is a single mother with six children living in a two room thatched roof house. 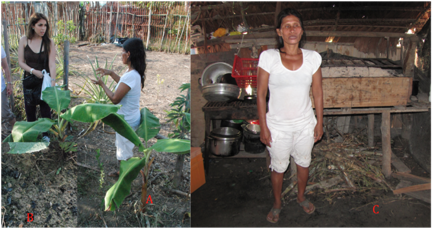 She has a small business cooking for people in her settlement and grows much of her own food in a relatively small plot. She uses a very simple indoor open fire which produces a large amount of smoke in the family’s bedroom. Hilde has embraced the idea of using an efficient biochar cookstove to reduce her reliance on purchased wood, while also reducing the risk of her children getting respiratory and eye diseases from the smoke in her home. Hilde attended this demonstration and received one of the 30 stoves engineered by Professor Stephen Joseph and Mr D. D. Khoi of Population Environment and Development (PED) Vietnam and built locally in Peru. Professor Annette Cowie from the University of New England and Stephen Kimber (NSW DPI) worked closely with MINAM staff to demonstrate and operate these stoves. The participants were impressed that the stoves operated well on low grade biomass collected nearby, such as leaves, crop residues, and bamboo. The stove demonstration boiled water and cooked lunch for the day. All were excited by the stoves’ performance, and interested in the idea of adding the biochar into their small farm plots. Hilde, in particular, understood the potential benefits of the biochar, having learned about traditional use of charcoal in soil from her grandparents. The project has identified other prospects for the technology, including the development of a cookstove for large (10-20L) pots. Feedback on the women’s perception of the cookstoves will be gathered by IT and Dr. Ladd, with performance evaluations conducted by the Australian team over the next few months. For more information on this project, please contact Lukas van Zwieten at lukas.van.zwieten@dpi.nsw.gov.au.